At the end the class Hatsumi sensei came to me, took the wooden ken I got from Tanaka san* and showed me how to hold the Ken. The Ken is versatile and the many possible 握り nigiri (grips) reflect this. Sensei demonstrating these grips to me precised that the many ways of holding the weapon implied the ability to change the grips freely according to the body movements. If you play tennis or golf you already know that. Different grips are used in different situations. 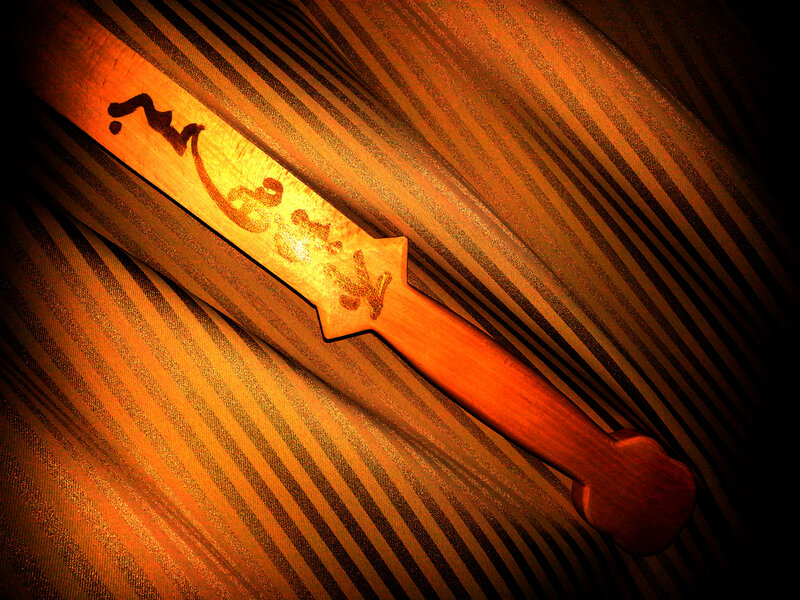 The Ken is really a refreshing weapon because it is the extension/expression of our taijutsu. Nothing is wrong and everything goes. The freedom of action of the Ken should reflect the way we lead our lives. After many years when sensei taught us to be happy, we are now free to live for ourselves. 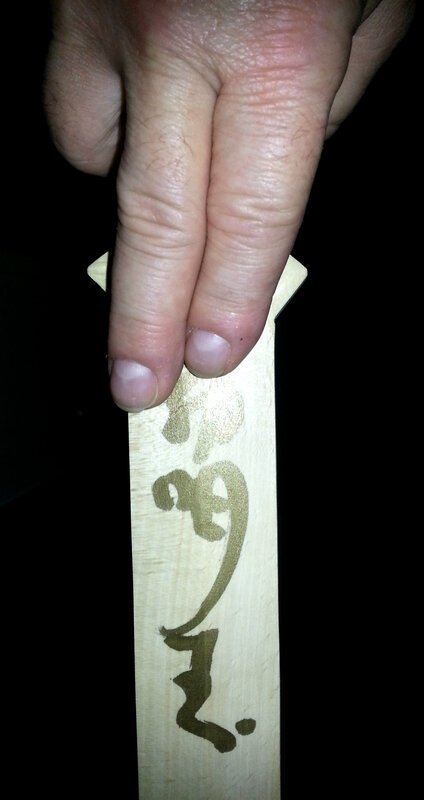 During the calligraphy break, sensei wrote in gold letters the bija mantra for Fudô Myô on my Ken. As you all know, Fudô Myô is a major divinity in Japanese Budô, and he holds a Ken with a vajra/sanko handle in one hand. Fudô Myô is often represented symbolically by a Ken. You would often find a simple Ken or a dragon wrapped around the Ken engraved on the blade of the Samurai to bring the divinity’s protection to the warrior. Fudô Myô (Acala)** is dark skinned, surrounded by the flames of sapience in which are hidden 9 karasu (crows). In Japan, the legend goes that the crows are the eyes of the gods watching our human behaviour. They caw to report to the gods. Fudô is a myô***, i.e. 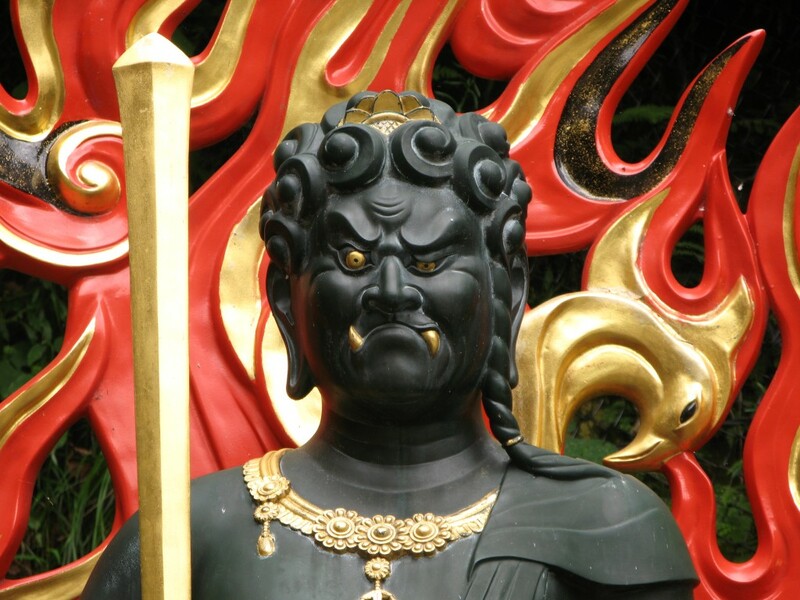 a “angry-faced” divinity. He is benevolent, his left hand carries a mala (nenju, rosary) to catch those of us going away from the righteous path. He is holding a Ken in the other hand to cut our passions. Fudô has one eye looking up and the other looking down, one tooth going up, one tooth going down. Fudô is a protector like all Myô divinities. Hereafter you will find the grips that sensei was kind enough to teach me at the end of Sunday class. In his explanations sensei insisted again on the importance of having a lot of mobility with the fingers to make the blade alive and move freely. Train that at home. the tsuba is flat and the fingers are a natural extension of your body movements. You hold the tsuka and your forefinger is extended on the tsuba and directs the blade. You hold the tsuka and your thumb is extended on the tsuba to thrust the tip flat in a kind of boshi ken. You hold the tsuka and your fingers are extended on the tsuba and direct and secure the blade. I see it as a kind of “ihen” in-between grip. It can be used also for thrusting (palm up). Used when hiding the blade and to change side rapidly or to hit with the kashira. 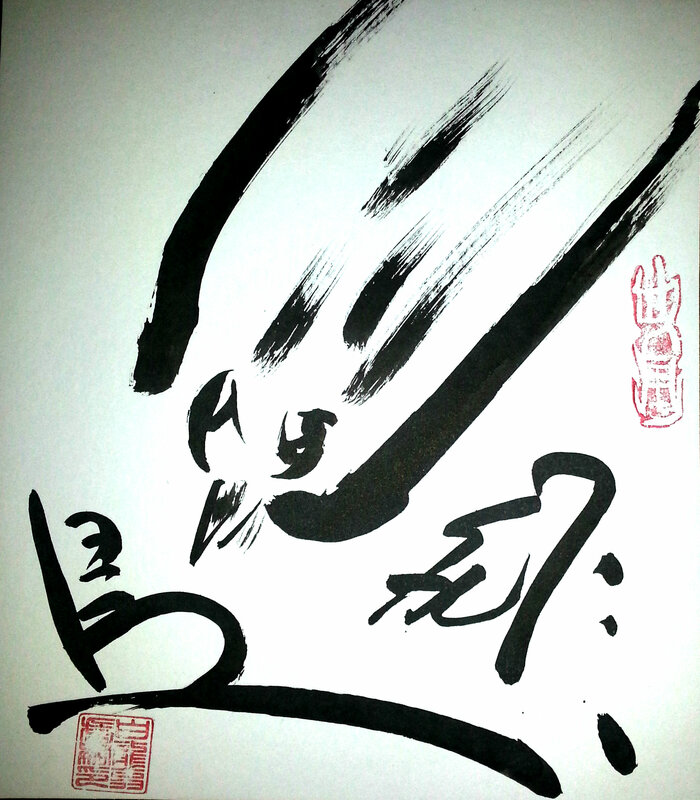 During the break and before writing on my Ken, sensei drew a bird diving to attack that I believe to be a crow: “hichô” he said simply while handing it to me. Later when he wrote the bija Fudô Myô on the Ken, he also wrote: カー “kaa” on the opposite side of the Ken: the cawing of a crow. Be aware of coincidence and be open to reinterpret always what you think you know until you stop thinking and only act freely. This is what you learn when training in the Bujinkan under such a fantastic master. Interesting how the various grips seem to imitate certain mudra. Here is a link explaining the Myo-o in greater detail. Thanks so much for sharing Arnaud!! Gambatte! Hi there! I really enjoyed this post because it joins so many things I learned in the last years with help of Acala who I dedicated my life to. I would like to know where I can order such very special bokken. Or is it an unique item made by you people? What is the exact name of this item? Would be very happy if you have answers for me!